How Frequently Should Seniors Go to the Doctor? How Often Should Aging Adults See Their Doctors? Many people only see a doctor once every few years, which is a serious mistake seniors must avoid at all costs. 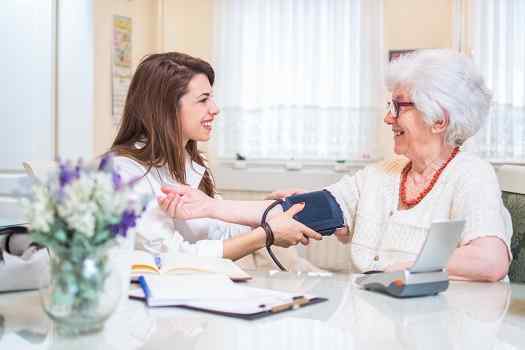 Scheduling regular checkups is one of the best ways for older adults to stay healthy and catch medical issues well before they become life-altering complications. Here’s a closer look at how often older adults should schedule checkups with their primary doctor, eye doctor, and dentist. Most experts agree relatively healthy adults should try to visit their primary doctor at least once a year. During those checkups, the doctor will take a close look at all of the vitals, including heart rate, temperature, blood pressure, and blood sugar levels. Seniors can also discuss any health concerns they might have. If the doctor believes there are serious issues going on, he or she can recommend a specialist or schedule additional tests. Some doctors suggest older adults schedule annual blood and urine tests as well. If your loved one needs assistance getting to and from doctor’s appointments, consider hiring a professional caregiver to help when you aren’t able to be there. Green Valley respite care professionals can assist seniors with a wide array of daily tasks, offering family caregivers the chance to focus on other personal responsibilities or take a break to prevent burnout. Whether it’s for a few hours a day or a few days a week, respite care is the perfect solution for family caregivers who are feeling overwhelmed. As seniors grow older, they may need to undergo various health screenings in addition to their annual checkups. Unlike general appointments with the doctor, these screenings test for very specific health issues that are common among the senior population. At least once every three or four years, older men should be tested for prostate cancer, abdominal aneurysms, colorectal cancer, and high cholesterol. Senior women need to be screened for ovarian cancer, breast cancer, and osteoporosis once every few years. Those who smoke or use other tobacco products must also be tested for throat, mouth, and lung cancer every 12 to 18 months. Many seniors make the mistake of avoiding dentists until they notice serious issues, but it’s important to remember most minor dental issues can easily be taken care of as long as they’re caught early. As a general rule, relatively healthy seniors need to schedule a dental checkup once a year. As for eye doctors, it depends on the senior’s vision and overall health. Some eye doctors suggest scheduling annual appointments, while others believe it’s perfectly fine to schedule checkups every two to three years. Some seniors with health conditions such as arthritis find it challenging to take care of necessary daily hygiene such as brushing their teeth and flossing. Seniors can face a variety of challenges as they age, many of which can be mitigated with the help of professional in-home caregivers who provide high-quality senior home care. Green Valley families trust Home Care Assistance to help their elderly loved ones age in place safely and comfortably. In addition to regular checkups, seniors and their caregivers must keep an eye out for life-threatening medical issues that need to be addressed right away. Older adults must immediately head to the hospital if they notice any major issues with the chest or head. They also need to keep a close eye on their overall demeanor and cognitive skills. Sudden changes to memory or speech patterns could be the result of a minor stroke or heart attack. Those issues are often accompanied by physical symptoms such as lethargy and dizziness. It’s important for seniors to visit their doctors regularly to ensure their long-term health and wellbeing. If your elderly loved one needs help maintaining a high quality of life while aging in place, reach out to Home Care Assistance, a trusted provider of Green Valley senior care. Our caregivers provide transportation to and from medical appointments and social events, nutritious meal preparation, assistance with daily exercise, and help with everyday tasks like bathing, grooming, and light housekeeping. Trust your loved one’s care to the professionals at Home Care Assistance. Reach out to one of our compassionate Care Managers today at 520-625-2050. What Are the Primary Reasons Aging Adults Get Arthritis? What Makes Seniors More Susceptible to Getting Sick?